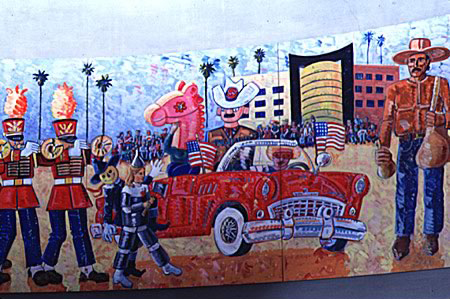 Romero’s Festival of Masks Parade is a sixty-foot curved mural located at the west end of the Wilshire/Normandie Station. 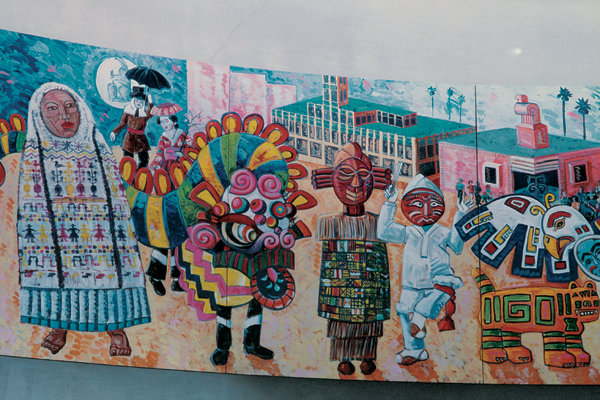 This colorful and festive mural depicts the annual parade of masks held along Wilshire Boulevard each fall. Many characters in full regalia stroll along the Boulevard including a Chinese dragon, people in African masks, a Native American eagle dancer, a Korean traditional dancer, a group from a Brazilian carnival, a giant calavera puppet, a marching band and bagpipe player, and the scarecrow from The Wizard of Oz. A bright red convertible leads the parade. In the mural’s background one can see a sampling of local architecture: the Craft and Folk Art Museum, an art deco camera store, the Brown Derby, the El Rey Theatre, Bullock’s Wilshire and the May Co. Building. The whole scene is framed by a sky that goes from night to day, with a bright moon and tall slender palm trees. "I selected this theme because the parade is a popular event which celebrates the rich multi-ethnic cultural traditions of Southern California in an atmosphere of high spirits and pride. The Mask Parade takes place along one of my favorite architectural landscapes—the mid-Wilshire area known as the Miracle Mile. I have documented and participated in this festival for many years." FRANK ROMERO was born in East Los Angeles and now lives in the Angelino Heights District of Echo Park, and has a studio in the “Frogtown” section of the Elysian Valley. He began his art career in the early 1970s as a participant in the art collective Los Four. Romero explores Chicano iconography—flaming hearts, low-riders, skeletons, the corn goddess—which he uses to tell the stories of the barrio and the resurgence of ancient myths in contemporary urban life. His public murals can be seen on the 101 Freeway and on the side of the Victor Clothing Company on Broadway in downtown Los Angeles.